A tribute to the Pepin familys Cuban cigar heritage, the Flor de Las Antillas is a box-pressed Nicaraguan puro with a sun grown wrapper from the Namanji region of Esteli. Full flavored and well-balanced, these Nicaraguan sticks are smooth, deeply rich, and masterfully constructed. Premium cigar from my father cigars. Sun grown, full bodied, but smooth. Box pressed; Some spice on draw but a sweetness on exhale, ie, cocoa or cedar. A very different flavor than anything else. Great value! For a beginner cigar aficionado, the Flor de las Antillas Toro was a pleasurable cigar with a great flavor from the start to the finish. Price, delivery, & ease of ordering were exceptional . Really nice cigar for the money. An excellent high end cigar in taste, aconstriction, and burn. My Father is a favorite of mine since I first tried them. flor de las antillos is one of the best in all catagories. The flavor is very good with out being over the top.The price point is reasonable for a cigar of this caliber. This is a smooth, even-smoking vitola, with a real Habano flavor profile. My go to smoke with a dram of Laphroig, or Lagavulin scotch. Decent draw and mild to medium flavor. Overall, a good cigar for the price. This cigar won the 2012 cigar of the year from cigar aficionado so I tried one and they have been a staple in my humidor ever since. I smoke gran cantidad’s more often because of the price but when I have a special occasion to celebrate this is my choice. I truly enjoy this cigar since it provides me the perfect balance of smoking a milder cigar that still has the taste and zest of a stronger smoke. It draws a nice puff every time and is well constructed. It providuces an even burn and a nice white ash to prove it. If you want to take a break from your stronger cigars, but not give up the taste that may be lacking from a milder smoke, then this is the cigar for you. And, that makes it a perfect cigar treat for any time of the day. Excellent value in a cigar. While I've only been smoking cigars for a few years now, this cigar is by far one of my favorites! Smooth, full and always seem to burn great. I recommend these to anyone who asks for a good cigar. Liking a particular cigar, or not so much is a personal choice. 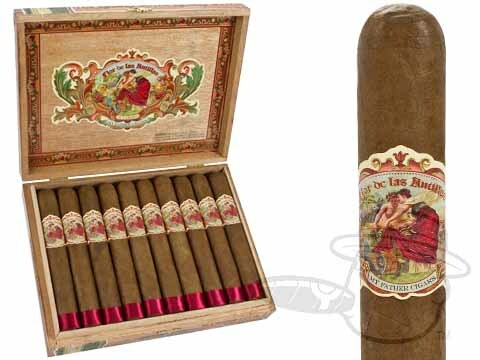 Flor de las Anrillas Toro has been my cigar of choice when needing a gift, everyone likes it! My Fathers Cigar has become my favorite after work and relax time smoke. For $6, I have the taste and aroma of a much more expensive smoke. Along with the Oliva Series V Mel, a great cigar! Can't remember. Only smoked one. To me, this is just a mighty fine cigar that weighs in at the medium level making it perfect for the deck in the morning with a cup of coffee or evening with a glass of water or even sipping on some Garrison Brothers Bourbon. Oh, inexpensive too. I believe it's time to light one up now! Slowly becoming my go to cigar!! These are the best cigars I've ever had. The only one I smoke anymore. If you start stocking it again let me know pls. Finally a cigar that tastes and draws the same all the time with no lingering unpleasant after taste. My all time favorite. Good cigar, smooth, good draw. A little milder than I like but good flavor. I like this cigar when I am playing golf. It will last 9 holes and smokes great to the last draw. Great smooth testing smoke that burns evenly & Best Cigar has the best price I've found for these. These are some of my favorite cigars. I've bought 3-4 boxes over the years and I highly recommend them. Very cuban-esque. A mild, creamy smoke with no harsh flavors. It deserves the high rating given by CA, especially for appearance and construction. The flavor of the smoke from beginning to end remains the same. It burns evenly and the ash hangs on (precisely and firmly rolled). As an experienced cigar smoker who likes maduro wrappers, it does not have much of a cocoa/coffee note. It's a pleasant smoking cigar if you want a change from robust and flavorful cigars. This is a fantastic stick!!! Especially for the money, it's one of the best cigars I have had. Nice and spicy. Not too heavy. Definitely recommend this cigar. These are wonderful cigars. Easy to smoke everyday, they are smooth and flavor packed. The aroma is bold yet the notes off your tongue are delightful and lasting. A good pairing for any time of the day. These are currently my favorite cigar. My experience in purchasing from Best Cigar Prices was very good. For the price, this cigar outshines many more expensive brands. Never a bad draw or burn. Try the cigar sometime. One of my favorite cigars. Tobacco is very refined. A nice, full draw that is airy and creamy throughout. A real treat. Flor De Las Antillas Toro is rated 4.5 out of 5 based on 50 customer ratings.